Long-Trem Stay Summer Guests living in GW Housing can purchase parking permits to the University Garage, 800 22nd St NW, via the online parking application directly through GW's Office of Transportation & Parking Services. Guests will submit an application and make payment for any contracted Parking Services direct with Transportation & Parking Services. To assure that parking is pre-loaded onto a Housing Courtesy Card at check-in, permits should be purchased by 5:00pm the Wednesday prior to the guest's arrival date. Parking purchased after that time or on the weekends will not be available until the next business day. Should you park in the garage before your parking permit is processed please see the attendant before exiting the garage. Summer guests must display the printout of the parking permit on the dashboard when in the garage. Only the registered vehicle is eligible for parking in the garage. 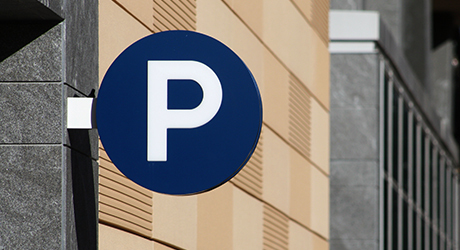 Long-Stay Parking Permits will be available for purchase starting May 1, 2019. Please see the Long Stay Parking Customer Service tab below for more information. Should you have any problems please see the attendant in the garage before exiting. Unfortunately no refunds can be issued once the vehicle leaves the garage. If the Housing Courtesy Card is lost the guest should first obtain a replacement card from the Housing Office in Amsterdam Hall 2350 H St NW. Then contact the parking office at the number listed above to transfer parking onto the replacement card. Unfortunately the Summer & Conference Housing staff does not have access to directly assist with parking related issues. Check out GW's Visitor Parking website for additional details. The Mount Vernon Campus is located on Whitehaven Parkway off Foxhall Road NW. The entrance to campus is off of Whitehaven Parkway onto Campus Drive. The Mount Vernon Campus Garage has an Attendant on duty from 7:00 a.m. to 11:00 p.m., Monday through Friday. Summer Guests parking in the garage should print their online permit and place it on the dashboard in order to avoid a citation when the garage closes at 11:00 p.m. Guests exiting the MVC garage will have to show their summer parking permit to the Attendant to exit at "no charge". Location: Upon entering on Campus Drive the garage is located on the left just before the clock tower. GW does not have space to accommodate parking for buses, large recreational vehicles or trailers. Standard size vans or trucks can be accommodated with a maximum height of 6’5”. For information on approved motorcoach parking locations in the District please reference the DC Department of Transportation (DDOT). DC Law prohibits buses with a seating capacity of twelve (12) or more persons idling for more than 3 minutes while the motor vehicle is parked, stopped, or standing, including for the purpose of operating air conditioning equipment in those vehicles.